North Royalton Honoring our Past Proud of our Present Poised for our Future • North Royalton has the 6th lowest property tax rate of all cities in Cuyahoga County. • Our City has one of the highest credit ratings from Moody’s Investor Services, which lowers costs on City projects. • Improved infrastructure through $1.4 mil investment in road improvements in 2017. • North Royalton’s 4.6 mil Wastewater Capital Improvement Project will provide the lowest cost for complete sanitary sewer service of the 7 surrounding cities in Cuyahoga County. • City Green Project provides a new pavilion, restrooms and charging stations. • Creation of the Chippewa Creek Headwater Park located behind the Library and YMCA through a grant from the Ohio Department of Natural Resources. • Economic development plan to help businesses thrive. • Tax incentives that encourage job growth & creation. • Access to low interest loans and grants to promote expansion and investment. • Convenient access to three major highways for transport of goods and services. • Excellent city, schools and safety services. Enjoy the Good Times and Fun at Danbury! When was the last time you could step out your door and join warm and friendly people in a variety of fun opportunities! Enjoy people your age and generation who talk the same talk and like the same music. Enjoy all this in a safe, fun and caring atmosphere. Danbury will bring fun back into your life! Another perfect day at Danbury. No part of this publication may be reproduced by any means without the written permission of the publisher. Advertisements and listings in this publication are provided as a public service. Image Builders Marketing, Inc. is not responsible for errors or omissions, and inclusion does not constitute an endorsement or recommendation. Image Builders Marketing, Inc. would like to extend a special thank you to all the business organizations and individuals who take an active and enthusiastic role in the North Royalton Magazine & Community Guide, especially our advertisers who provide the financial support to make this a successful community project. We hope that you enjoy the informative features contained in this publication and will keep it as a reference guide for community and advertiser information. 3	Welcome to North Royalton! On the Cover: North Royalton Business & Community Leaders, see page 13. 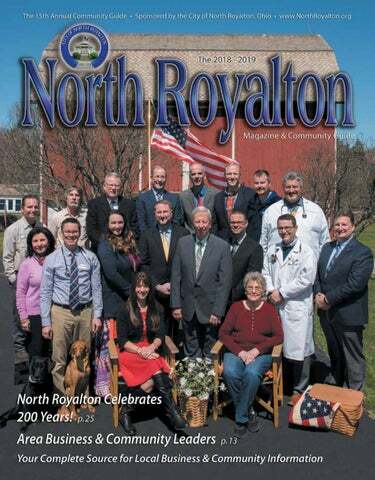 Cover Location: North Royaltonâ&#x20AC;&#x2122;s business and community leaders gathered at the Historic Pozna Barn located on Tilby Road between Ridge and York Roads. Photographer: Andrea Bartel, Beverly David Photography. and delicious food supported by organic grown farming methods. They offer on-site harvest, package-ready, or pick-your-own vegetables and fruit. More centrally located is Grace Brothers, which brings a Community Supported Agriculture (CSA) program to customers. Through the program, Grace Brothers partners with regional farmers to provide customers with fresh fruits, vegetables, and other food items. Residents can join the Community Garden to plant and grow their own fresh produce. The garden is located on State Road, near City Hall. “Because of the demand for garden space, the garden will continue to grow with more plots in 2019, through a partnership with the Eagle Scouts,” added Stefanik. North Royalton Community Garden; Aukerman Park features an on-leash dog agility course. everywhere, but unique restaurants are a special attraction for a city to have.” North Royalton has many dining options. Tony Maloney’s Pub & Pizza is a locally owned restaurant with a fantastic outdoor patio. Niko’s Bar and Gyros offers Greek and American favorites. Olesia’s Place serves up American Ukrainian dishes. Mario’s is operated by a graduate from North Royalton High School. Other restaurants located throughout the city include Carrie Cerino’s Ristorante & Party Center, a well-known destination point in Northeast Ohio; Matteo’s, another Italian stop; Mastro’s The 3 Spot, home for the sports fan, serving American dishes and Loder’s Shake Shoppe, serving hot eats and cool treats. activities. Recently completed, the Chippewa Creek Headwater Park, located behind the North Royalton Public Library and YMCA, is 12 acres of natural beauty. The park includes a 480 linear foot trail, a 770 square foot shelter with educational stations sharing the importance of preserving wetlands and giving details about the plants and animals that call North Royalton home. Not only is North Royalton a welcoming place for wildlife, but pets have a special place also. Aukerman Park, located at York Road and Valley Parkway, is a space where pets and their owners can appreciate the outdoors. The park features an agility course to challenge your pet and connects to the Emerald Necklace All-Purpose Trail, a 32-mile continuous trail from the Rocky River Reservation to the Cuyahoga Valley National Park. In addition to the Metroparks, North Royalton is home to other amenities for outdoor activities. Memorial Park, off State Road, has a playground, pond, two pavilions, tennis and basketball courts, and a skate park. City parks also include Heasley Soccer Fields and York Road Recreation Baseball Fields. The City Green project at the Town Center. 10 designated life flight helicopter landing zones. costs. North Royalton has one of the lowest cumulative wastewater charge per MCF (million cubic feet), compared to several surrounding communities. community center and an outdoor pool. “There is a great demand for senior living,” said Stefanik. “Elder residents can stay close to family and continue living where they grew up.” Other senior living sites are being proposed for the future. Located high on a friendly hill, the City Green Project will enhance the social gatherings at the Town Center, benefiting the Harvest Festival, Community Festival, Pet Carnival, and other events. Included in the project is an iconic two-level entertainment pavilion. The lower level will be 1,100 square feet and will include a fireplace, charging stations, and modern restrooms. The upper level will be 2,240 square feet, serving as a perch to take in the beautiful view from one of the highest points in Cuyahoga County. other transportation equipment. They commit to being an integral part of their customers’ success by providing outstanding customer service, technological knowledge, experience, and commitment to all their transportation equipment needs. 2017 was a fantastic year for Transport. They were named one of America’s Fastest-Growing Private Companies by Inc. 5000, Aurora Parts “Dealer of the Year”, and recognized as one of Cleveland Plain Dealers “Top Workplaces”. Transport Services was also named Hyundai Translead’s official dealer for the State of Ohio. Transport Services is happy to have its headquarters located in North Royalton. The community has been supportive in their expansion and is proud to represent Northeastern Ohio as they continue to be the premier transportation equipment provider. Royalview Elementary students meet with Superintendent Gurka; North Royalton High School’s Homecoming King and Queen; Veterans visit with students on Veteran’s Day; (next page) Valley Vista students hard at work. clubs and leadership programs. Middle school and high school students have the opportunity to participate in a wide range of intramural and interscholastic athletics, as well as a large spectrum of clubs, leadership opportunities, and scholastic achievement organizations. Parents are encouraged to become actively involved in our schools. There is a PTA at each building. Parents and residents also serve in an advisory capacity to the administration through committees such as the Curriculum, Instruction and Assessment Committee; Business Advisory Council; Senior Citizen Advisory Council; Financial Advisory and Audit Committee; and the Community Facilities Advisory Committee. Our Band Boosters, Choir Boosters, and Athletic Boosters have raised thousands of dollars to support the athletic and music programs, as well as supporting our students every time they march out onto the field or appear on a stage. North Royalton City Schools is dedicated to providing the education students need today to prepare them for the world of tomorrow. With the help and support of our community, we look forward to creating new levels of greatness. For more information on the North Royalton City School District visit our website: www.northroyaltonsd.org and find us on Facebook and Twitter. April - Annual D.E.A. Spring Drug Take Back May - Senior Class Mock Car Crash and Parents Who Host, Lose the Most Campaign Through community conversations we educate and inform our community and help reduce youth substance use. community coalition in North Royalton and Broadview Heights, deeply rooted in the North Royalton City School District and our mission is in reducing youth substance abuse and promoting a drug-free community by empowering youth and adults to make responsible decisions. Our vision of a community united for safe and healthy living starts with community members like you who are committed to working with us for drug-free neighborhoods. This caring group is comprised of individuals who live, learn, work and worship in our communities and come together to help maintain and better our community by focusing on youth drug-prevention and good decision making at any age. This is accomplished by providing community education through resources, awareness campaigns, community conversations, and creating a culture of tolerance and acceptance. Join us at a meeting to find out how YOU can get involved. For more information, visit www.phnr.org. First Row (Seated, left to right): Lisa Bargmann, Owner, Holistic Halo Salt Spa; Rose Pozna, North Royalton resident. Second Row: Maria Magnelli, North Royalton Chamber of Commerce and Royalton Recorder; Dr. Adam Hechko with Kali & River, Owner, North Royalton Animal Hospital; Amy Kuntz, Coalition Director, Partnership for a Healthy North Royalton; Peter Bergmann, President, UH Parma Medical Center; Robert Stefanik, Mayor, City of North Royalton; Sam McCartney, Administrator, Diplomat Healthcare; Joe Bocanegra Jr., MD, Southwest General Health Center; Gregory J. Gurka, Superintendent, North Royalton Schools. Third Row: Jason Dorcik, Vice President & Matt Dorcik, President, Friend-Lee Automotive; Dr. Patrick McCluskey, Owner, Timber Ridge Neck & Back Pain Clinic; Larry Antoskiewicz, Council President, City of North Royalton; Thomas Jordan, Dir. of Community Development, City of North Royalton; Pastor John Zahrte, Royal Redeemer Lutheran Church; Chris Schaffran, Owner, York Road Auto Body; Mark H. Meacham, MD, Southwest General Health Center. Missing from Photo: Terry & Janice DeLap, Owners, The Cleaning Authority; Sheri Stafford, Community Liason, Partnership for a Healthy North Royalton; Vincent LoSchiavo, Owner, Tony Maloneyâ&#x20AC;&#x2122;s and Antonioâ&#x20AC;&#x2122;s Pizza. Photo location: The historic Pozna barn on Tilby Road owned by North Royalton resident Rose Pozna. Photographer: Andrea Bartel, Beverly David Photography. FOSTERING THE BOND BETWEEN FAMILIES AND PETS When choosing an animal hospital, you’ll notice that North Royalton Animal Hospital is different from what you may have experienced in the past. Family-owned since 1957, North Royalton Animal Hospital takes great pride in creating a warm and friendly environment where all your pet’s needs are served. They provide on-site laboratory services, digital x-rays, advanced vaccination protocols, pain and comfort care programs, and surgeries. They are also handicapped accessible and have a child friendly atmosphere. If your pet requires hospitalization, they have a separate “Comfort Room” to provide a quiet and peaceful environment for you and your family when visiting your pet. Dr. Adam Hechko serves on the board of directors for the American Animal Hospital Association (AAHA). Through the American Association of Feline Practitioners, the hospital is certified a Cat Friendly Practice® Gold which is designed to elevate care for cats by reducing the stress for the cat, caregiver, and also the veterinary team. Their doctors and team also incorporate low stress handling techniques for the pets. The relationships between doctors, their patients and families are very important to Dr. Hechko and his team. They spend time discussing your pet’s health, whether for preventative care or a time of illness. While waiting, you can enjoy refreshments and homemade cookies, sit by the fireplace or watch the fish tank with independent waiting areas for dogs and cats. There is an intensive care unit with an expansive treatment room where patients are monitored throughout the day by the highly skilled and qualified team. Revolutionary laser therapy offers a holistic approach for many common pet illnesses. For frolic and fun, the Paws at Play Resort & Daycare has over 4,000 sq. ft. of rubberized floors and outdoor turf. Canine play dates, vacations, and rejuvenation days can be scheduled in their sunny, deluxe, spa-like resort environment with pampering by their groomers. Feline pets have an independent boarding facility with scenic views of the outdoors! Bereavement meetings and a private Memorial Garden with bricks to commemorate your beloved friends is located between the hospital and the resort. Bricks can be engraved with a pet’s name and a special sentiment. Our Bereavement Group meets the 1st Thursday of every month. North Royalton Animal Hospital is an AWARD WINNING ACCREDITED PRACTICE for the United States and Canada! They were selected for outstanding achievement in Quality of Care, Teamwork, Client Service, Practice Management, Leadership, and especially for their unending Service to the Community! Pets are their passion, and keeping them healthy is their #1 priority. York Road Automotive Service, Inc.
achieve a high degree of certification covering the entire collision repair process. In addition, they utilize an environmentally friendly PPG Waterborne Paint System. York Road Automotive Service is a family-operated, one-stop collision repair facility that has been serving North Royalton and its surrounding communities since 1977. They appreciate your confidence and look forward to working for you the next time your vehicle needs repair. They’ll get you back on the road quickly and safely! s franchise owners of the Broadview Heights office of The Cleaning Authority, Janice and Terry DeLap think that you will agree with their favorite slogan - Life is too short to clean your own home! They are confident that their numerous clients in North Royalton and surrounding communities would agree. Whether you are a busy family, retiree, road warrior or simply don’t like spending your free time cleaning your home, it’s time to let the cleaning professionals at The Cleaning Authority handle it. The Broadview Heights Cleaning Authority participates in the TCA Cares program. Throughout the year they ask for non-perishable food donations that are collected from the homes of their clients by the cleaning crews. These donations are distributed locally to various organizations in need of food. In past years these collections have been distributed to the Greater Cleveland Food Bank, St. Augustine’s Hunger Center, Audrey’s Outreach summer school lunch program and the food pantries in North Royalton, Broadview Heights, and Strongsville. The Cleaning Authority employs a Detail-Clean Rotation System that specifies what their Certified Professional Housecleaners will do on each clean, so you know what to expect in every room of your home. While your entire home is cleaned every visit, The Detail-Clean Rotation System is designed to additionally detail clean specific areas. When The Cleaning Authority does your housecleaning, you get the perfect combination of professional quality and personal service with a 100% satisfaction guarantee. Janice & Terry are members of the North Royalton Chamber of Commerce and support the North Royalton High School Athletic Boosters and Band Boosters. In addition, they support the Cleaning for Heroes program which provides cleaning services for military families in need. Conveniently located in the Royalwood Plaza, 12901 State Road in North Royalton, 440-409-7258 (SALT), HHSaltSpa.com. Also visit us on Facebook. *Holistic Halo Salt Spa does not intend to diagnose, treat, cure or prevent any disease. oyal Redeemer is a great place to meet new friends, find needed encouragement and discover God’s plan for you. Here you can be yourself, get involved, and regularly discover truths that can change you individually as well as enrich your life with the truth of God’s Word. At Royal Redeemer, you will find friendly people, an encouraging message, worship styles to fit different tastes, and great programs for everyone in the family. Royal Redeemer is a church that is all about building relationships, raising Your strong families and staying connected Photo from to the community through the love God offers all people in Jesus Christ. cover photo Come and check out Royal Redeemer for yourself. You will be glad you did! t’s hard to believe that it’s been 25 years since my staff and I started Timber Ridge Neck and Back Pain Clinic. My, how time flies! We have run our clinic based on one very key principle that we’ve never strayed from. P.S. Ooops... I almost forgot. If you have never seen me and would like to become a new patient, simply give us a call at 440-884-0083 and we will give you your first day free. This is normally a $250+ value, but if you present a copy of this article before treatment, it’s yours free. *Medicare and federal insurance eligible for free personal consultation. Excludes additional treatment. Two exceptional family physicians. One exceptional family practice. Have Your Vehicle Serviced the FRIEND-LEE WAY! allergy sufferers, this means itchy, watery eyes, irritated throats and runny noses. Any or all of these symptoms can make you feel miserable and tired. “Pollen and mold are common culprits. Obviously you can grab an over-the-counter allergy medication, but you also can do other things to help minimize symptoms,” notes Mark H. Meacham, MD. • At home and in the car, close the windows and run the air conditioning. • When pollen and mold levels are high, stay indoors. Wear a pollen mask outside. • Once indoors, wash your hair and change your clothes. • Ask others to mow the grass. • Don't hang clothing or linens outside to dry. • Take allergy medication as prescribed. Southwest General has convenient locations for any medical care you need. Call Health Connection at 440-816-5050 or visit swgeneral.com for more information. The North Royalton Real Estate Market is HOT! were afraid to sell in the past 5 years are now able to sell their homes at much higher prices and in shorter timeframes. The number of pending homes in North Royalton this March, compared to last March, was up 22%. In that month, there were 59 homes on the market, 50 went under contract, and 33 transferred title. Also, average price per square foot from the same month a year ago is up 18.5%. Nothing says it’s time to sell louder than these numbers! 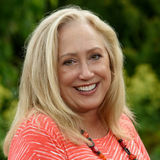 The shortage of listings is also creating demand in a market where there are pre-approved buyers waiting to find a home. There is almost 20% less inventory on the market in North Royalton then last year at this time. Interest rates remain low, although they are predicted to rise this year. Buyers are able to achieve the American dream for lower payments than ever. Thinking about Selling or Buying? A local REALTOR® has information on future listings and preapproved buyers that is not public knowledge, and can frequently put a deal together well before a property would hit the market. Many times, the increase exposure will result in higher demand and a much higher price for the seller... or, an opportunity to buy a house for a buyer who has just missed the opportunities when looking on their own. The market is HOT! Contact a Howard Hanna REALTOR® at 440-971-5600 and have them help you with your home sale or purchase! It’s Not Your Father’s Assisted Living Residents playing bingo at Danbury Senior Living. North Royalton Office on Aging & Human Services •	Senior Transportation Connection provides local transportation to medical, grocery shopping or approved Senior Center events for elderly and disabled residents. To use this service a resident must be pre-registered by calling 1-216-265-1489. You can schedule your transportation by calling that same number, three business days in advance. •	Office is open Monday through Friday from 8:00 am to 4:00 pm for socialization, education, crafts, card playing, health care screening, free blood pressure screenings, senior exercises, chair yoga and other activities. The office is located on the lower level of the Deaconess-Perry Center Apartments at 13500 Ridge Road. If you don’t know where to look for help, call Debra Burrows, Senior Center Manager/Outreach Specialist, North Royalton Office on Aging at 440-582-6333 or visit www.northroyalton.org. •	We provide free assistance with Medicare, medical paperwork, social services, as well as information on Medicaid, nursing homes, Nursing Home Ombudsman, Salvation Army Service Unit and other programs. •	We assist with all government programs, including Golden Buckeye, HEAP, disability programs, Homestead programs, subsidized housing, community development, etc. •	The office partners with Royal Redeemer Church and Kiwanis for the holiday food program. August 4th Bicentennial Ball at Carrie Cerino’s. Tickets are $50.00, price includes open bar, appetizers, choice of dinner entrée. Entertainment provided by the band Twist. A full night of entertainment planned. For more details and tickets please contact the Chamber of Commerce at 440-237-6180. August 5th Picnic in the Park 1:00 pm - 8:00 pm. Live music by our North Royalton Community Band with a performance by North Royalton’s own Logan Wells and Jerry Colosimo. Jungle Bob will be there with his entourage of animals as will Magician Rick Smith Jr. A Corn Hole tournament, free popcorn, hot dogs, chips, beverages, Kona shaved ice and free raffles throughout the day. A day packed with fun for the whole family! August 10, 11 & 12th Community Festival Sponsored by the Chamber of Commerce. The party starts Friday night at 6:00 pm and runs through Sunday. Parade on Sunday at 3 pm. Sunday night fireworks at dusk will end the Festival. August 18th Old Timer’s Banquet at Royal Redeemer. You must be a North Royalton resident for at least 30 years and be at least 70 years old. Contact Ada Ahrens at 440-237-4754 for more details. •	October 27, 1818 - Royalton Township was created when the Cuyahoga County Commissioners detached 25 square miles from the Brecksville district under whose jurisdiction the area had been administered since 1810. •	November 9, 1818 - The first town meeting was held in the Robert Engle home. The first trustees were: David Sprague, Francis Howe, and Elias Keyes. •	1885 - Township officers were asked to change the township name to North Royalton. The request was made by post office authorities that had gone through years of confusion over mail delivery to the two Royalton’s. (The second Royalton was located in southern Ohio.) •	1932 - An extension of Settlement Road (West 130th Street) from Royalton to Bennett Rd. was approved. •	1932 - The first town jail was installed, a second-hand, two-cell block purchased from Ashtabula. •	1932 - The west wall of the town hall collapsed while excavation for a new basement was in progress. The federal Works Progress Administration (WPA) came to the rescue and a new building with auditorium was constructed for a total of $21,000. •	1934 - The Cleveland Electric Company was awarded a contract for street lights and the State Highway Department installed traffic signals at two Royalton Rd. intersections: State Rd. and Ridge Rd. •	1935 - Sidewalks on Royalton Rd. were completed. •	1937 – a new town hall was built. •	1942 - World War II occasioned expenditures of funds for radio service for the police department, (first suggested in 1927); emergency establishment of a fire department; and the purchase of an emergency ambulance equipped for first aid. •	1947 - Water lines were brought into the Center. •	1948 - The growing population sparked an addition of a north wing to the town hall and subsequently a second story to the north wing, and a new south wing and interior remodeling, all of which cost $115,000. House numbers were also assigned. •	1950 - Gas lines were brought into areas of the village. •	1961 - North Royalton became a city. •	1969 - Final papers were signed for the purchase of 20 acres of land to be used as Memorial Park. •	Through the years, for various lengths of time, the town hall provided room for school classes of all grades, the library, the post office, and scores of civic, service, and social group meetings. Special thanks to the North Royalton Historical Society. Residents enjoy Metropark trails; Fr. Estok and his dog, Buddy; Dr. Hechko and family at the North Royalton Pet Carnival. Marking 100 Years of Service to the Community As the City of North Royalton celebrates its bicentennial year, the Chamber of Commerce commemorates 100 years of service to the community. In 1918, a group of farmers and shop keepers began an association to make sure North Royalton had its share of commerce generated by SR 82 improvements made by motor vehicles, telephones and electric lights. By 1923, the North Royalton Township Improvement Association was born, and eventually grew to be a thriving Chamber of Commerce. 2017 N. Royalton Community Festival pageant winners. Community, and helps city officials work toward bringing new business to our city. The Chamberâ&#x20AC;&#x2122;s publication, the Royalton Recorder, has been providing residents with all their local news since 1941. For more information about membership in the Chamber of Commerce, stop by at 13737 State Road, North Royalton, OH 44133, call 440237-6180, email rrnews@aol.com or visit nroyaltonchamber.com. Thank you North Royalton! Want to be in the next Image Book? Valleaire Golf Club & Banquet Facility Celebrating 55 Years! Loving family owned & operated! 13664 York Rd. www.nuzzlers.net Here to help life go right. Monday – Friday 8:00 a.m. - 4:30 p.m. Saturday 8:00 a.m. – 1:00 p.m.